Looking to gain more revenue and a stable financial structure, MoviePass, the movie theater subscription service, will roll out three-tier pricing plan starting in 2019. This is to account for different size U.S. markets, higher demand opening weekends, and large-screen theaters. The first basic plan, called Select, will be priced at $9.95 to $14.95 a month. Differentials address existing movie theater pricing in large and small markets. For this package, consumers can see three movies a month, but not during a movie’s high demand opening weekend. In addition, 3D movies will also be excluded. All Access is the next pricing level, at $14.95 to $19.95 a month, which includes high-demand opening weekend attendance for those three movies but no 3D films. The priciest package is Red Carpet at $19.95 to $24.95, which allows for opening-day screening, as well as one of the three films per month to include a IMAX and/or 3D movie. 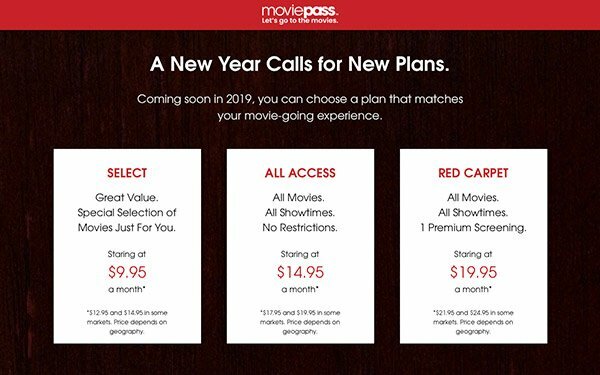 MoviePass parent company Helios and Matheson Analytics has had to drastically alter its monthly subscription pricing plan a few times since it changed its financial model in August 2017. Pricing was then dropped to $9.95 a month from $50 a month, where subscribers could see as much as one movie a day in a month. As a result, MoviePass membership rocketed to 1 million from 20,000. But in summer 2018, MoviePass was running out of cash, and was unable to pay for tickets at movie theaters. AMC Theaters, which has been in a battle with MoviePass over its low-price service, said its business plan is unsustainable. AMC started up its own movie subscription service in June. In August, MoviePass moved to a three-movie-a-month limit. The company's reasoning was that only 15% of MoviePass members see four or more movies a month.